That’s my deal…your conference…your book…let me come out of attending or reading and get just one thing that I can use. It’ll be worth my time, my money and probably get my wholehearted recommendation. Why just one thing? Like many of my peers, I’m always bringing my “A” game, usually one thing can steam roll and give me a way to see from a new perspective on a task that I’ve been frustrated with. Keep in mind I’ve attended and written many trainings on search from basic boolean to more advanced topics and certainly covering all kinds of online resources. Boolean at it’s essential levels (AND, OR, NOT) does not change, so reading about it again and again won’t necessarily offer some sort of mind bending epiphany. Search Engines and their “tweaks” do (some might refer to those as modifiers). Over the years I’ve put a few search books that remind me to look for those changes and nuances (in addition to my training manuals) on to the office bookshelf for easy reference, and this week I added a new one, by Moises Lopez. 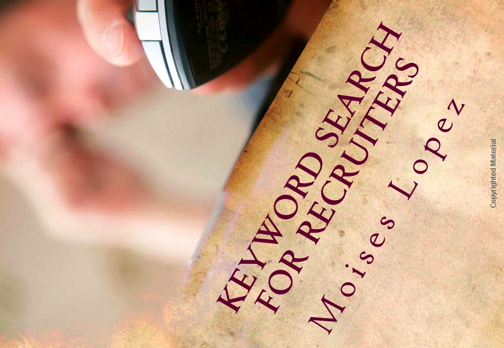 It’s called Keyword Search for Recruiters. Lopez’s new tome is an interesting read. Initially the book is a diatribe of what’s wrong with the sourcing industry that too much focus is placed on training people on how to search and not enough emphasis placed on resourcing and strategizing keywords. 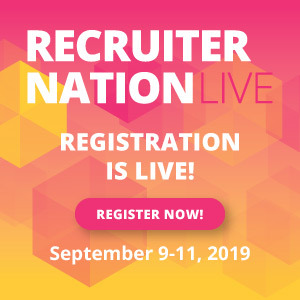 I get it…and I think emphasis on keywords and strategizing with them is a good second tier training for any sourcer or recruiter (of course you have to teach someone how to fish first…). Unlike many sourcing books, Keyword Search for Recruiters leaves boolean and search methodology until later in the text (Chapter 3) and then continues to sprinkle search string methodology through several chapters, not necessarily in a structured, logical manner you’d be use to if you’ve taken an AIRS course or used one of Shally Steckerl‘s early millenium “Cheat Sheets”. What was of value? Well I cracked it open to up my Keyword Search game, and within the first 20 pages I was being reminded of how searching a database is different from searching online, and I should consider that as I review my ATS results. I knew this, but seeing it in writing as a reminder got me to restructure how I prepared my ATS search strings vs my Google search strings. ATS’ search functionality typically doesn’t allow for similar or related words, it’s literally matching word for word. Keeping this in mind and leveraging the 500 characters my ATS now allows per search, definitely makes keywords, well, key. Later in the text, tools like Keyword Eye, Keyword Map, VisuWord, Google Adwords and Firefox’s Keyword Generator Add-On add value to any sourcer’s online toolbox when you get the proverbial brain freeze and are looking for new ways to strategize and work smarter. Are these tools brand spanking new? Not necessarily, but they’ve probably been lost in the shuffle of learning how to perform the mechanics of sourcing and are excellent to re-introduce when you’re training turns to expanding the keyword vocabulary. So I’m putting this book on my shelf. Will it be the first one I hand off to my new sourcer? No. It’ll be second. We’ve got to get that boolean down and understanding each Search Engine’s nuances first before we get crazy on keywords. But when it comes time to talk about keywords and leveraging them, building them out and tools to get that job done, then Lopez’s book will be handed off for review.